Babs Tarr is quickly becoming one of the biggest names in comics with her historic run on BATGIRL. Now she brings her manga influenced artistic talent to Harley Quinn in the Harley Quinn Red, White and Black Harley Quinn by Babs Tarr. 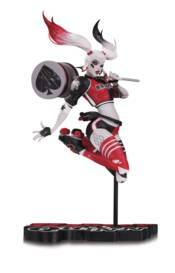 Harley is displayed in her rarely seen roller derby wear and brings her classic giant mallet.